Not to be confused with KO Star. Characters fly away from the main stage as they are turning into a star, demonstrated in Lylat Cruise. A star knock-out or star finish (星バースト, Star Burst), abbreviated as star KO, is a type of KO. When characters are knocked beyond the upper blast line (save for a few exceptions), they fly through the background and away from the stage while usually screaming or shouting, and eventually disappear as a star. In Melee and Brawl, this has the longest duration out of any KOs. Along with Star KOs, there is a chance of a Screen KO happening instead, where characters slam into the camera. Most conditions on the characters, such as the invincibility of the Super Star or standby mode after breaking the Smash Ball, are still visible on the characters while they are Star KO'd. Exceptions include metal characters in Melee and Brawl (unless while playing in Super Smash Bros. Melee's single player modes), giant or tiny characters due to Super or Poison Mushrooms in Super Smash Bros. Brawl, and frozen characters in Super Smash Bros. 4. In Flat Zone 2 and Hanenbow, conditions are not aligned with the character (i.e. the frozen block and character fly off separately). In Super Smash Bros. 4, Star KOs are no longer a certainty; the upper blast line will cause either a Blast KO, a Star KO, or a Screen KO at random. Players launched at extremely high speeds, however, are not Star KO'd or Screen KO'd. In addition, presumably as to solve balance issues, Star KOs no longer occur when there's only five seconds remaining in a timed match and in Sudden Death (unless an unknown glitch occurs or in Trophy Rush. ); Screen KOs were increased in length, and as a result, Star KOs actually last shorter than Screen KOs. In Smash 64 and Melee, all playable characters have a voice clip for being Star KO'd (including Samus), while Olimar lacks one in Brawl; SSB4 later introduces more characters that remain completely silent when Star KO'd, with these being Mega Man, the Mii Fighters, Pac-Man, Villager and the wireframe version of Little Mac. Ultimate adds Isabelle and Piranha Plant. In Ultimate, the characters now tumble away from the screen and go a much further distance away from the stage. Characters also now use a sideways version of their tumbling animations. The star is also now a purple color. Players can also be Star KO'd regardless of knockback speed, like the first three Smash games. The Team Rocket trio "blasting off again" in the Pokémon anime. It is a recurring trope, especially in Eastern media, for characters and objects to be sent flying into the sky, leaving behind a twinkling star when they vanished from sight. Since Star KO'ing an entire team in Melee yields the Rocket KO bonus, the Star KOs in Smash may be intended as a reference specifically to the trope's use as a running gag in the Pokémon anime, where the Team Rocket trio would often be sent "blasting off again" whenever they were defeated. Unless otherwise noted, all of these exceptions also apply to Screen KOs. Fighting Wire Frames (except for Event 37: Legendary Pokémon). Opponents in Event Matches: Kirby's Air-raid, Super Mario 128, The Yoshi Herd, Puffballs Unite!, Game & Watch Forever! Comet Mystic (10000 points): Finished the match while in the middle of a Star KO. Star Finish (10000 points): Cleared the stage via a Star KO. Trickster (11000 points): Star KO'd every member of a team. Rocket KO (5000 points): Star KO'd every member of a team. Shooting Star (1500 points): Finished the match while getting Star KO'd. Solar Being (800 points): All KOs experienced were Star KOs. Star KO (300 points per opponent): Star KO an opponent. In the original Super Smash Bros., Kirby's various Copy Ability hats remain on when he is Star KO'd. Super Smash Bros. is the only game in the series where a player can Star KO themselves regardless of if they were hit or not. This can be best seen if Ness uses his jumps and PK Thunder straight up on either Hyrule Castle, or his Break the Targets/Board the Platforms stages. 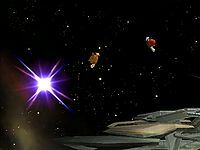 In the Camera mode in Super Smash Bros. Melee, by maneuvering the camera into a certain position, the "trick" of the Star KOs is revealed: once the defeated character hits the upper blast line, they get shifted toward the background as their tumble animation starts, before reappearing onscreen for the KO animation. If the cage the Mii resides inside on the Find Mii stage sustains sufficient damage, the Mii and the cage will be Star KO'd, though no sound effects play when this occur. In SSB4, King Dedede and Cloud's voice clips for being Star KO'd are longer than the time allotted for the Star KO animation. In SSB4, if a character is way beyond the upper blast line and gets Star KO'd, the character will fall into the background faster than usual, but the Star KO length will still be the same. The same result can also be executed in Melee by going into the debug menu, selecting the Home-Run Contest stage and getting Star KO'd there. In SSB4, looking closely, Jigglypuff's mouth animates with its Star KO voice clip (though it can sometimes be seen smiling). If by any way Jigglypuff is Star KO'd without its voice clip playing (like being frozen), its mouth will not animate.